What’s in Bangkok for a Filipino traveler? We hear about Bangkok. We hear about Thailand, but what’s to see when you’re from Manila or the Philippines? What’s to consider when visiting Bangkok as a Filipino? I decided to join my parents during their trip in Thailand. It’s not everyday to you get to have a chance to. Last July 2017, I stayed at Bangkok for four (4) days and three (3) nights. My parents attended a homecoming reunion hosted by one of my father’s college batchmates from Thailand. I have a knack on going with loved ones and friends on trips. I do this so I can spend time with them and benefit from the discount you get with group travels. Alternatively, I do clueless commuting (like my solo Japan trip last November 2016). Too bad I wasn’t geared for this. I don’t have words enough to explain how Bangkok is ‘THE’ place to be if you want to go for a wardrobe overhaul. 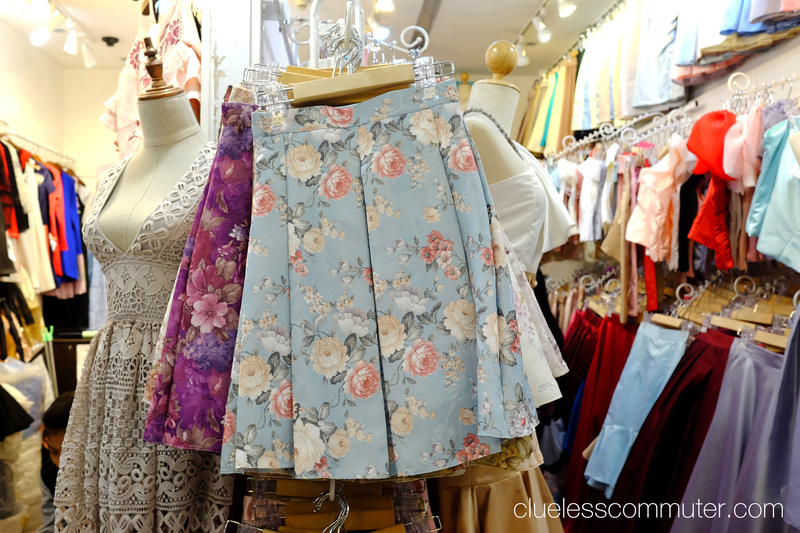 Converted to Philippine Pesos, you can get fashion finds for as low as PhP 300. All this already with the quality, fabric and style as what I see in Forever 21 stores. Flowing dresses priced somewhere around P2200 when converted to PhP. Their fabric, cloth quality and cut are refined craftsmanship. They are comfortable to wear. They have the flair. They set the trends (you see in Manila). The clothes are flattering. Exquisite prints and quality fabrics are used for Bangkok clothes. If I get to visit Bangkok, Thailand again, I’ll make sure to save up and bring home an enormous amount of fashion finds with half the cost. 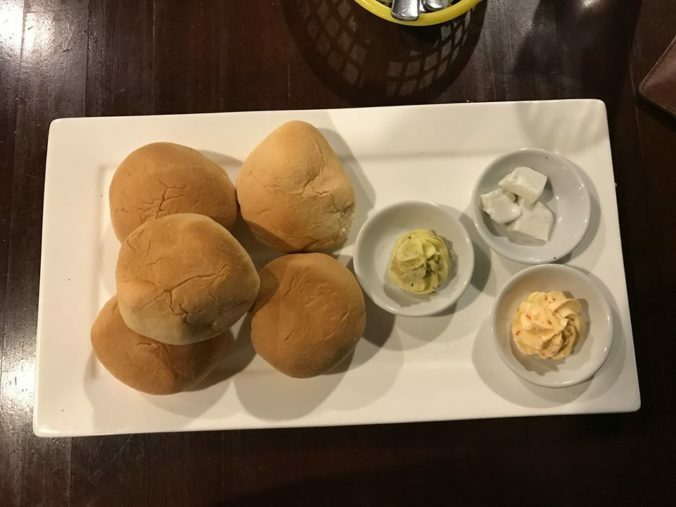 Kanto Freestyle serves Hot Homemade Pandesal. It’s a Filipino concept diner that brings you Pinoy local breakfasts, street style. A few of my colleagues have repeatedly mentioned Kanto Freestyle. I was only able to visit it this week when Ez and I needed a late dinner fix. Since Makati Avenue caters to night life and after party eats, Kanto Freestyle is also open until late. If I’m not mistaken it’s even open 24-hours. Where is Kanto Freestyle in Makati? Kanto Freestyle’s Makati branch is located at the end of P. Burgos Avenue and Makati Avenue, a few steps near J.P. Rizal Avenue. As far as I know they have a prior branch in Kapitolyo, Pasig City that actually started the buzz. Kanto Freestyle in Makati is located at the end of P. Burgos and Makati Avenue. It’s already a few steps to J.P. Rizal Avenue. 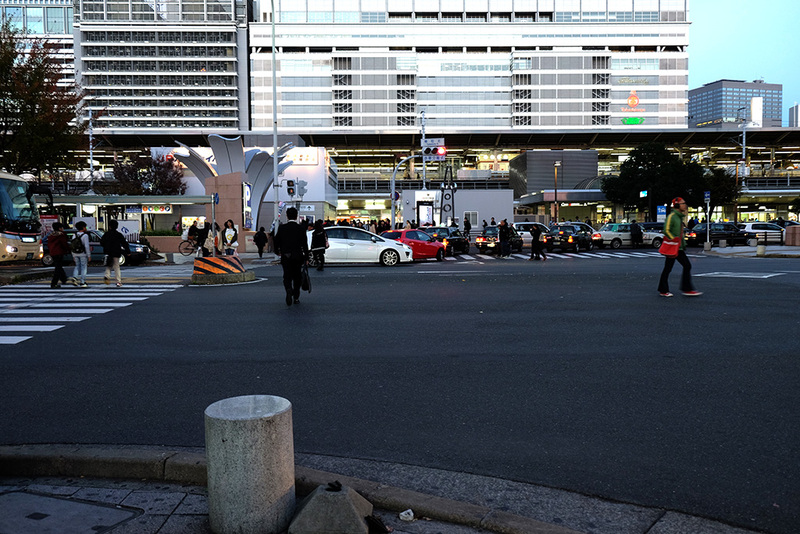 People might get confused since Kanto is located at the corner of the two avenues. 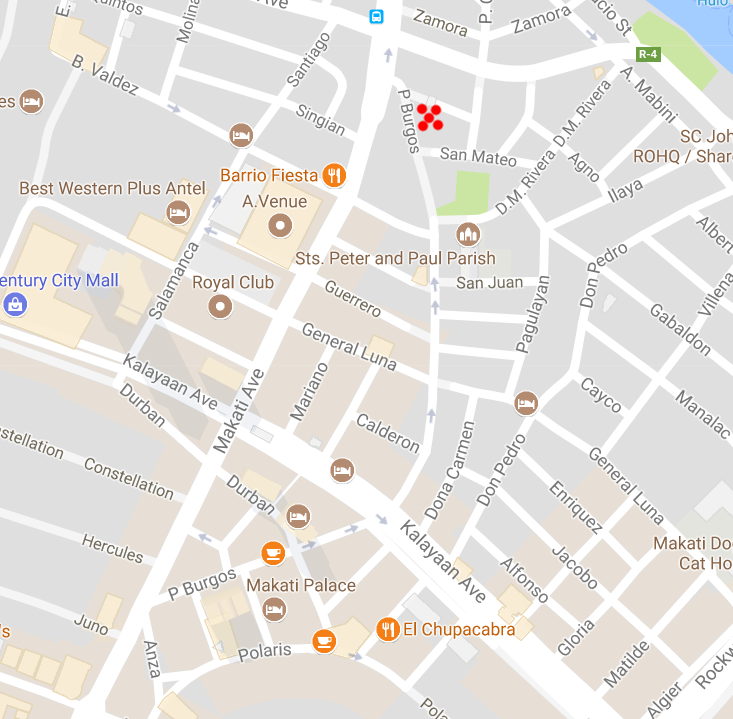 P. Burgos and Makati Ave. meet twice: one near Jupiter Avenue and the other one near J.P. Rizal. I believe it’s positioned as a place to get meals after tipsy friends end the night out. That’s why, they’d be open until the wee hours in the morning. But, more than that, their menu is designed so you can get a taste of Pinoy mix and match diner breakfast experience. You can get some bacon with a classic Pinoy Tinapa (smoked fish) topped with Herbed tomatoes, some eggs– name it and add it to your heart’s content. … With which, I’ll make sure to take a photo of their custom menu when I go back, okay. Ez was hungry. She decided to go for a rice meal. I was opting to be a bit more conservative, it was already late.I thought I needed something (subjectively) just enough for a midnight snack. So my friend here orders crisped Kanto Freestyle Fried Pork Belly. What a Pinoy classic to stare at for a midnight snack. 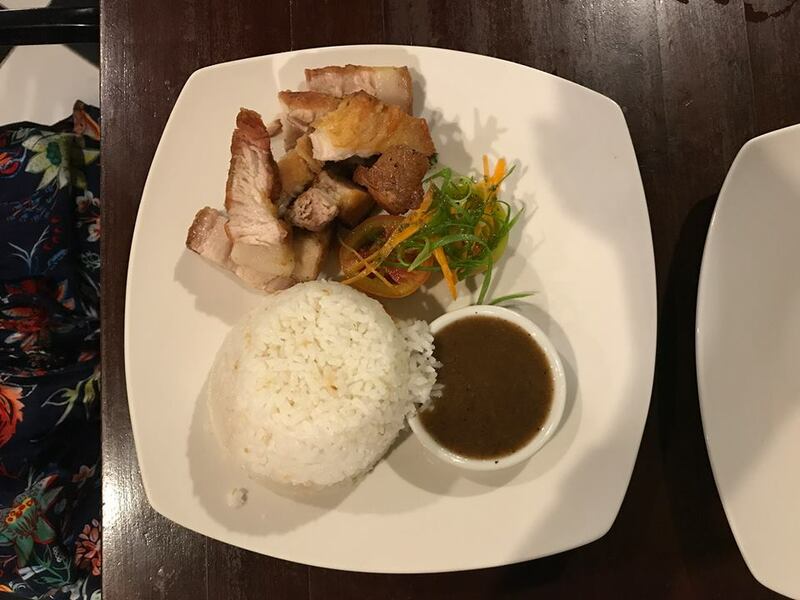 Ez orders Kanto Freestyle’s Fried Pork Belly (Php 110). It’s an everyday Pinoy street style classic. After that, her Grilled Suman gets served. It’s a Filipino native snack dessert. It’s made of glutinous rice drizzled with chocolate and ube halaya (I missed the ube in the photo, sad). 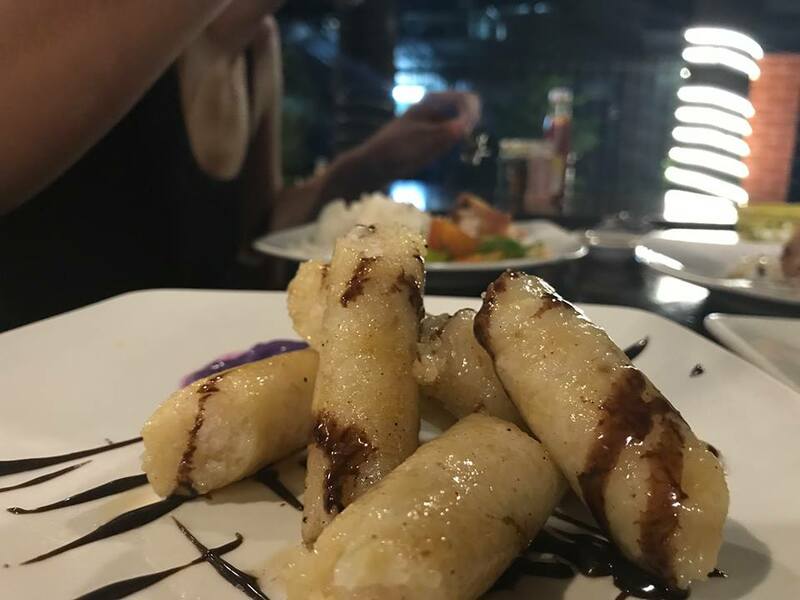 She also decides on having a native grilled suman (Php 85) for dessert. We shared them but boy, was that was h-e-a-v-y. I visited Kyoto, Japan last November 2016. This was one of the fanciest things I have stumbled upon during my day trip at Arashiyama (嵐山) Park, in Kyoto, Japan. If you look closely, the chocolate was made of delectable refined milk, sugar, and matcha powder. For some reason, it was really an unforgettable treat. The sensation of how it melted as I took my bite has not been paralleled by anything I know, yet. 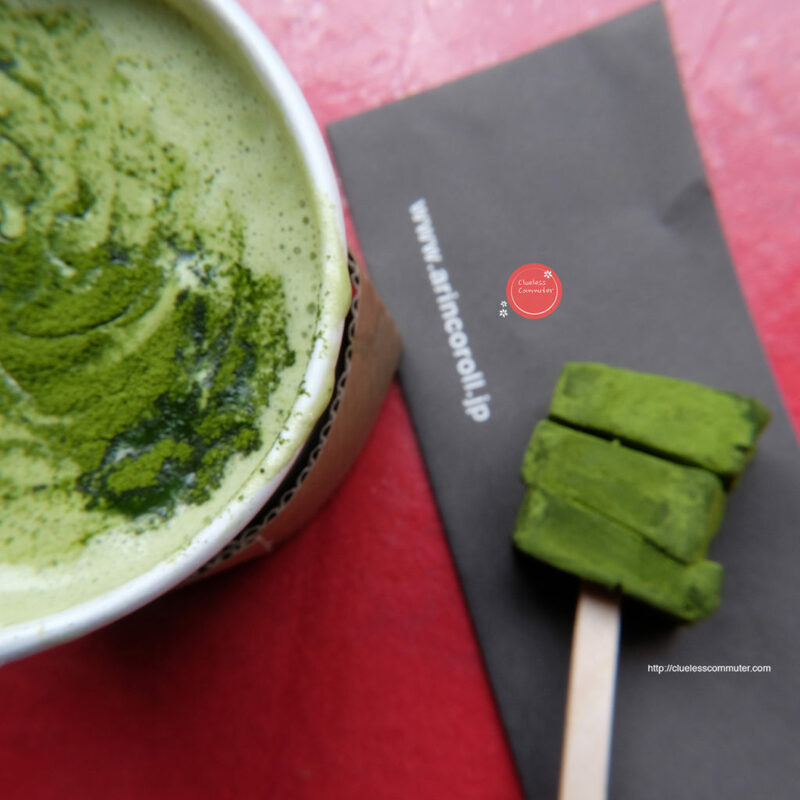 As you can see here: This matcha chocolate was hand crafted right there and then at Arino.jp branch in Arashiyama (嵐山) Park, Kyoto, Japan. 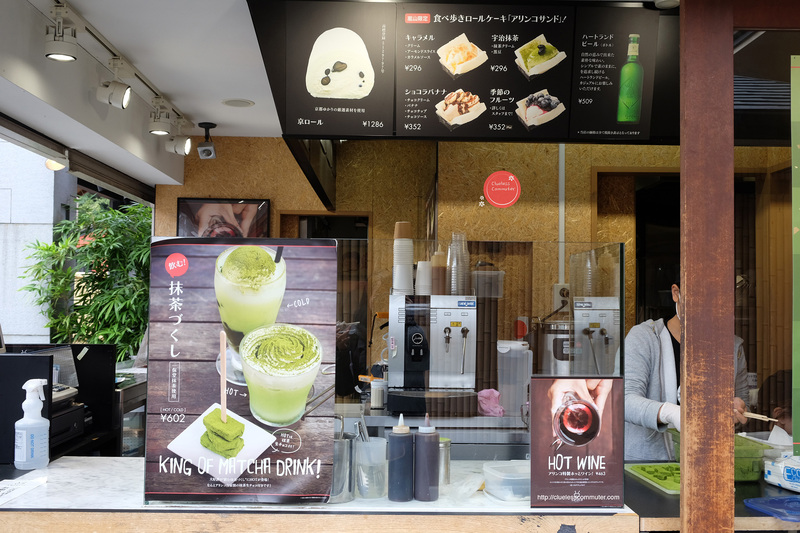 The lady right on the photo above is seen crafting the Matcha chocolate by hand. I wasn’t able to try this Kyo Roll on the photo. I know I’ll have to try it when I go back. It’s one of those things you’ll need a friend to share it with. Since I went to Kyoto, Japan alone, I decided to skip it during my last visit. I’ll tell you a secret. 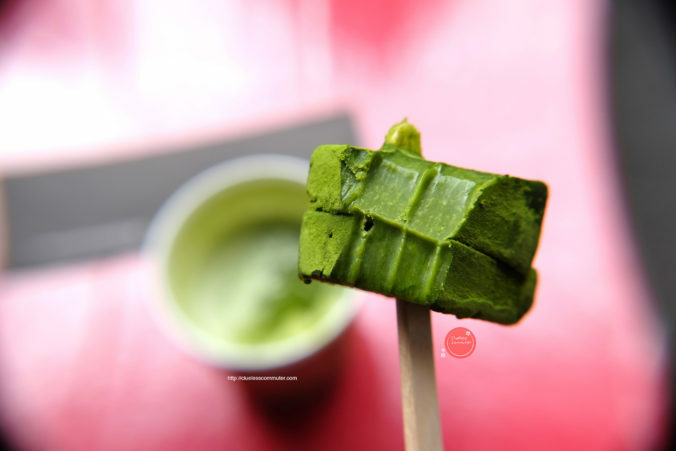 This Matcha chocolate, actually, fell on the cement floor. Yes. I ate it. It costed gold– and even if other tourists saw me, they’ll never remember who I was. Plus! It makes a great story now. The set comes with hot matcha milk. The drink didn’t quite made as much impact compared to the matcha chocolate, but they definitely blended memorably as a pair. The drink also became memorable as it was warm during the chilly November autumn weather. The matcha drink is actually available in a hot or cold variant. 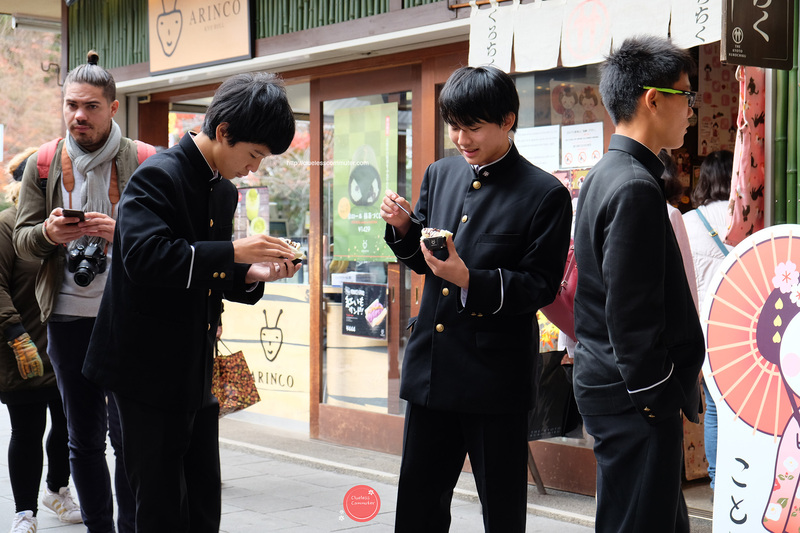 A few high school students seemed to have also been enjoying another local treat from Arashiyama (嵐山) on these photos. 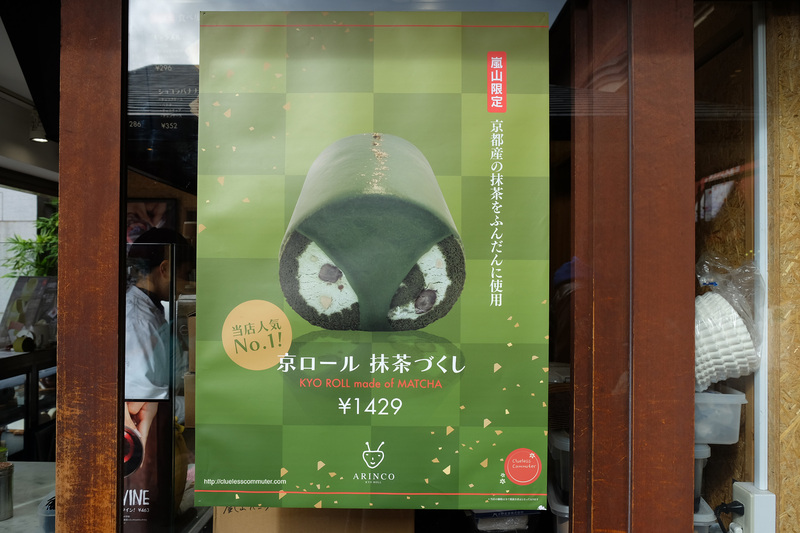 Try Arinco’s matcha chocolate and goodies if ever you get to visit Arashiyama Park in Kyoto, Japan. It’s just a delectable as how it looks. 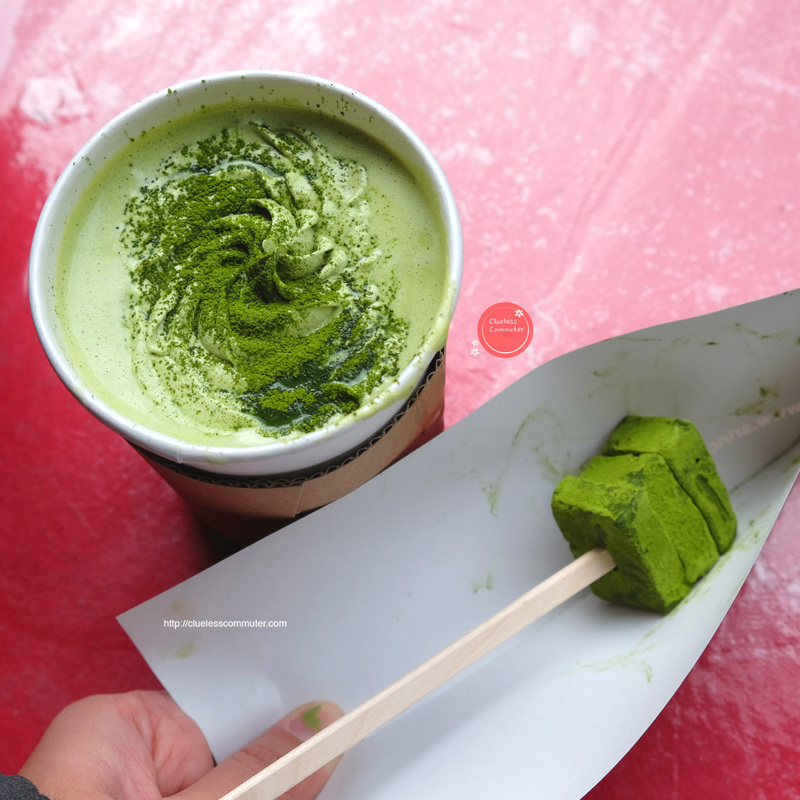 It was so refined and delectable, I can vividly recall how it the sensation of melting matcha felt inside my head. 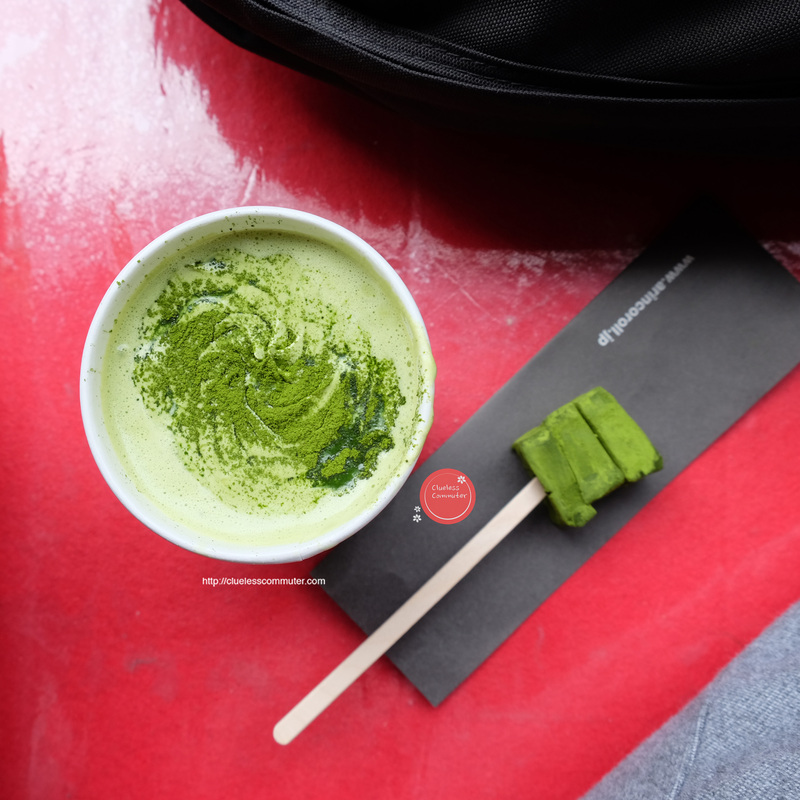 Meanwhile, leave a comment below if you’ve got a similar matcha experience to share. Until next time! 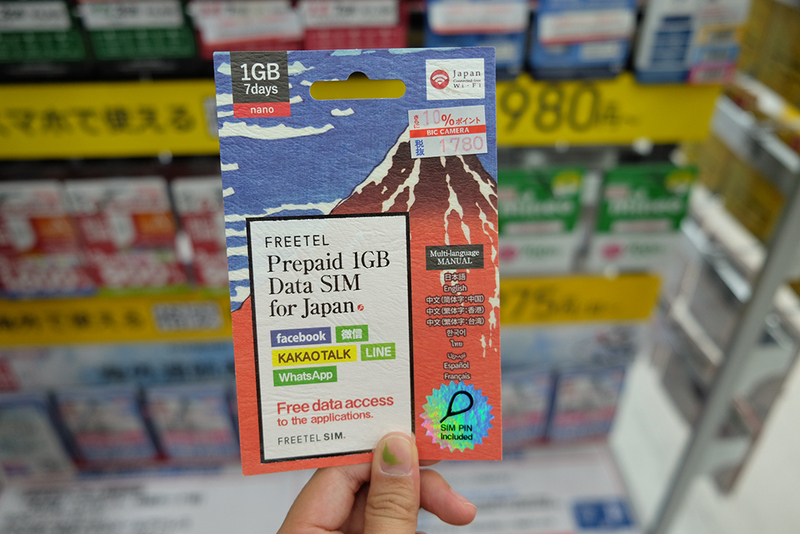 If you’re looking for cheap internet in Japan, a budget travel sim card might be just right. 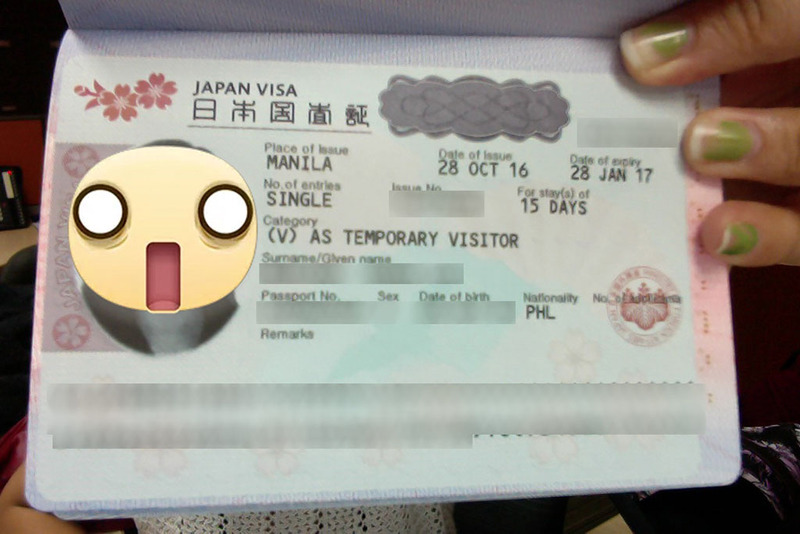 I got one during my Japan trip last November 2016. I went on a solo trip to Japan as a tourist, so a pocket WiFi would have been too much for my use. A good internet data access was a necessity since I didn’t speak their language and its easy to get lost in Japan. Need first time travel tips for your Japan trip? Chat Clueless Commuter here. I got myself an internet data sim card during my stay in Japan. Although convenient, this option can be a little pricey. Kiosks can easily be found in airports, but I wouldn’t recommend this, especially when you’re on a budget trip or there’s only one or two of you. If you’re traveling alone, it’s better to get a data sim card with your own open-line smartphone. An open-line smartphone, for those who need to know, is a phone that will accept any carrier sim card. They are not locked to one network and can work with a Japanese telco sim. A closed phone line will be of no use in Japan unless it was set to roaming before the trip. When you do not have an open-line smartphone, you’ll need to ask your telephone service provider’s help before you travel. I’m biased against getting roaming services. I think of them as overly expensive. Telco fees vary, plus you’ll need to seek approval from your Internet Service Providers. I can’t vouch for roaming, really, as I’ve never tried it before. Which brings us to a third option. This is the cheapest option for getting internet when visiting Japan. 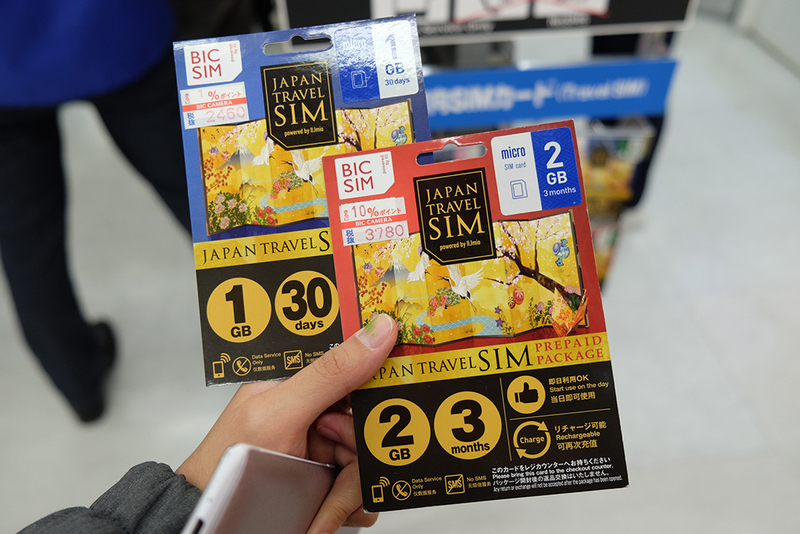 A data sim card is available for tourists who are staying in Japan for a limited time. You will need to bring your open-line smartphone for this during your travel. My data sim card only costed around 1700¥ + 10% tax during my week-long stay. That’s around ₱822 during my visit. Again, you have to be a tourist to get this sim. The cashier will ask for your passport upon payment. A full section of internet data sim cards are sold in Japan. Free FB, Viber, WhatsApp, etc. 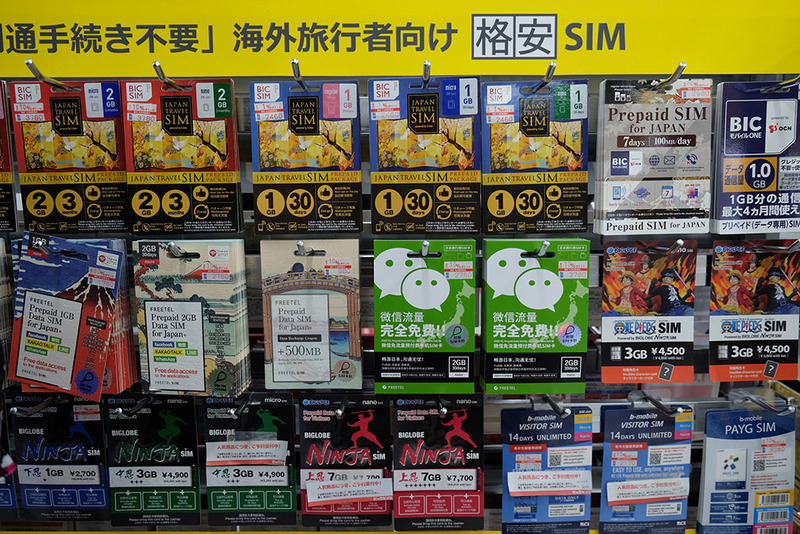 Some data SIM cards offer free messaging apps, which is a must if you get lost and need to chat a friend or Clueless Commuter while in Japan. Others offer free text messages for local mobile numbers, while others, additional data. Nonetheless, if you decide that the data SIM card is what’s right for you, read on for a few more tips. Don’t forget to bring Yen in Japan stores and shops. Travel SIM cards, as far as I know, are only for tourists. You have to be identified as a temporary visitor in Japan to be able to buy them. You will also need to prove you are eligible to do transactions. Also, a number of shops promote TAX FREE Shopping. NOTE: The tax free policy only applies to (A) Single receipt consumable items (make-up, food, etc.) worth ¥5000 or (B) Single receipt non-consumable items (clothes, gadgets, toys, etc.) worth ¥5000. Only tourists are eligible for this so they ask for your passport when you avail of tax free shopping. NOT all shops exercise this just like the one in this post. The store will need to configure it for you, so it’s better to bring the device when you buy. You can configure it by yourself when you go back to your hotel but I don’t recommend you do this. Even if the SIM pack comes with a manual in English, it’s better to have your internet working ASAP before you go. Japan is a non-English-speaking country. They understand key English words but locals will have to use sign language to get a message across. There will be English speaking staff, but, most likely, the one who approaches you first will be a local speaking staff. Just remember to respectfully and nicely ask, especially as you are the tourist here. Most importantly, you will need patience. You will have to wait for your turn since there are fewer English-speaking staff and a number who might be tourists. They are doing you a favor by helping you with your internet needs. I found an electronic store near Nagoya Station’s vicinity, in Nagoya City Center. There, I bought my internet data sim card. Electronic shops can be found there. I got my internet data sim card from BIC Camera store in Nagoya City Center. They’re just lying around there, waiting to be discovered. You will find them by walking around. If they have appliances, cellphones or electronic devices displayed by the entrance, it’s most likely going to be an electronic store. You won’t be able to read much since the characters will be in Japanese too. 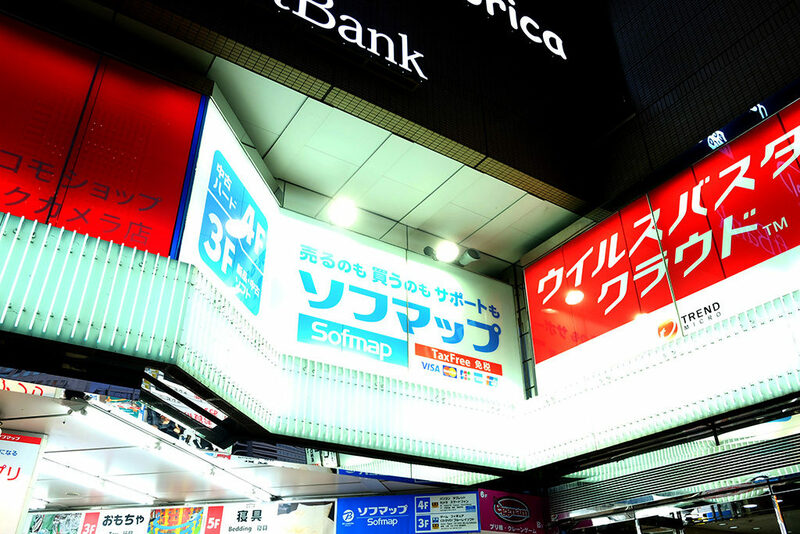 The electronic shop signages are in Japanese, so take note of this brands in their store entrances. Ask where the internet SIM Cards are. Say keywords such as, “English” to let them know you do not speak Japanese. They will find an English-speaking sales person for you. Or you can directly say “Internet Data Sim Card.” As I have mentioned, staff can understand basic English words. They just won’t be able to reply back. By saying this, they can lead you to the isle full of internet sim cards! Some sim cards are meant for 7 days, 14 days, while some are good for up to 30-90 days. Just check the package details. Make sure it will fit your smart phone or the device you will use it with. That’s why it’s important to bring the device you will be using with you during your purchase. Make sure it will work if you plan to go to Neko Island or other far-flung destinations in Japan. Ask your English-speaking crew about the internet company handling your chosen sim card for coverage. The sim card I got had free Facebook, Messenger, Viber, WhatsApp, etc. with it. It meant more data for searching in Google. The sim card still need to be configured so it’s better to have it installed before you leave the shop. There’s a few cheaper brands that seem to charge additional fees for installation. I did not pay extra since my manual had an English translation in it. In case you need to pay the minimal installation fee, I recommend you do so, instead of risking the chance of going home and not having a functional sim card. You will need to bring a separate open line smart phone if you plan to do this. I assure you– as a budget traveller, this will cover your basic internet use. It might be slower (than a WiFi) but it will cover basic GPS, maps, Google search queries and sometimes, free messaging Apps. There will be a lot of carriers to choose from. Others have better Sim Card networks which may be a bit more expensive with 4G or LTE capabilities. Just ask your English-speaking sales person. Also, since the Sim Cards are for tourists, you may also read the packaging since they are usually in English. During your Japan trip, your internet data sim card will meet your basic internet needs. It will have a decent GPS for maps. It will have a decent internet coverage for doing quick searches. And for starters, you will most likely just roam around known tourist places where there’s always going to be internet coverage. Better brands will have better GPS accuracy and internet speed. Just ask the English-speaking sales person on this. At the end, I just bought this since I will only stay there for 9 more days. I got this data sim card since it was cheap, and it was all that I would need. Internet data sim cards are really for Japan tourists to discover. For me, finding myself a cheap internet sim card was an experience on its own. I also found it fascinating how my friends from Japan did not know of this. They also do not frequent the shops I have mentioned here since their telco providers usually offer and deliver electronic services in package deals. After all, it has to be for tourists. 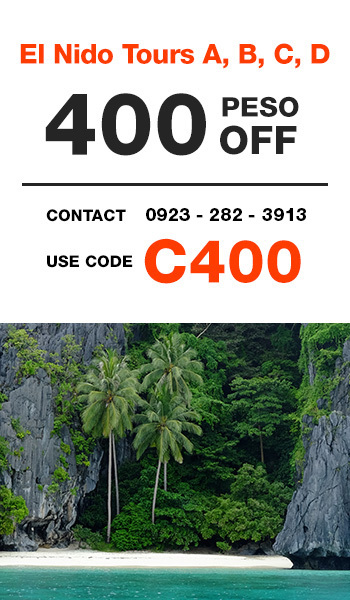 El Nido promo discount on boat tours. What is in El Nido, Palawan?